I grew up in the battered remains of a once vast hardwood forest in Michigan. I was lucky to spend my childhood wandering in a small surviving remnant. My forest was a sacred place. To me, the western plains felt dry, empty, bleak. But my oldest ancestors evolved on the arid savannahs of Mother Africa — grassland with scattered brush and trees. Grassland was where the big game hung out, and they were good to eat. Recently, I studied horse history, and learned a lot about the vast steppe grasslands of Eurasia. They were also home to big game and nomadic hunters. I began to get curious about grass. There are maybe 12,000 species of grass, and they inhabit climates between the arctic and equator. More than half of the calories consumed by humankind come from three grasses: rice, wheat, and corn (maize). Others include oats, barley, millet, sorghum, sugar cane, and bamboo. Clive Ponting noted that in the last 300 years, the world’s grassland has increased 680 percent. The forests of the U.S. Midwest were destroyed to grow corn, wheat, and livestock. The Amazon rainforest is being destroyed to create cattle pasture. So were the rainforests of Britain and Ireland. The list is incredibly long. 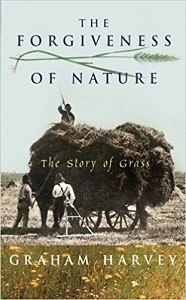 I discovered that a British grass worshipper, Graham Harvey, had written a passionate book, The Forgiveness of Nature: The Story of Grass. Harvey described the heartbreaking story of the American prairies. Farmers first arrived during an unusually rainy period. They plowed under lots of turf, tapped the fantastic fertility of the rich black soil, and had fantastic harvests for a while, until drought returned, and the Dust Bowl blew away millions of tons of degraded soil. Within 50 years, the party was over. Farming continues today, with significant yields, but the heavily diminished soil is kept on life support by fertilizer, pesticides, irrigation, and fossil fuel. Harvey carefully described the many ways in which evolution ingeniously created grasslands that could survive almost any challenge — except civilization. They created soil-building humus, which retained moisture and accumulated nutrients. Many plants have very deep roots, up to 32 feet (10 m), which bring up nutrients. They can tolerate fire, drought, and grazing. In fact, they need grazing, to nip off the first shoots of woody shrubs and trees that would compete for sunlight. Back in the good old days, on the steppe and prairies, the bison and other grazers manicured the turf, and the wooly mammoths controlled the woody plants. With the mammoths and mastodons gone, and elephants fading, humans in many regions around the world have adapted “firestick farming” to expand grassland area, control woody vegetation, improve the vitality of the forage, and attract game. Burning off the dry grasses eliminates hiding places for game, and provides a banquet of roasted grasshoppers and other delicacies. Grasslands are arid, receiving just 10 to 30 inches (25-76 cm) of rain per year. In wetter prairies, grass can grow tall enough to hide a horse. Lands getting less than 10 inches are desert. More than 30 enables forest. Britain is wet, not arid. Its grasslands are manmade. The land was once largely a rainforest. Over the centuries, nomadic pastoralists gradually cleared trees to expand meadows for their cattle, sheep, and pigs. Sheep sped the Brits down the road to ruin, a sheepwreck. The climate was ideal for producing wool of exceptional quality, which became a major industry, and made many people very rich. This led to the enclosure movement, during which peasant farmers were evicted from the land, so their fields could be converted into valuable sheep pasture. The wool gold rush generated much of the capital needed to launch the industrial revolution. Many of the evicted farmers migrated into rapidly growing urban slums that were crowded, filthy, and disease ridden. They were joined by hordes of desperate refugees from the Irish Famine. This generated widespread discontent that could not by soothed in gin palaces. The fat cats got nervous, fearing unrest and revolution. Grass came to the rescue. Liverpool, New York, and other cities began building parks, providing islands of green sanity amidst the industrial nightmare world. Delirious from perpetual growth fever, Brits joined the Americans in racing down the dead-end road of industrial agriculture — synthetic fertilizers, pesticides, big machines, fossil fuel, monocultures, feedlots, mega-farms. Maximum yields were the goal, <bleep> the topsoil, the ecosystem, the grandchildren. This explosion of pure idiocy drove poor Harvey bonkers. He goes to great lengths to enthusiastically educate readers on the magnificence of healthy topsoil, and the many ways that spectacularly stupid people foolishly destroy it. 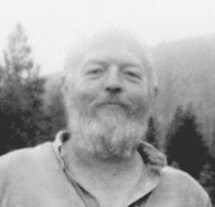 His grand vision is a wise transition to organic mixed farming, a three-year rotation of winter grain, spring grain, and a fallow of grasses and red clover — combined with regular application of all available manure. While this is better than the current norm, there are some important drawbacks. Every trainload of wheat shipped away to London includes essential nonrenewable nutrients that will never be returned to the farm. The soil nutrients sent to London stay in London, where they are mixed into toxic sludge. Anything less than 100 percent nutrient recycling is an enterprise with an expiration date. Britain usually has gentle rains, so less soil is washed away than in the U.S., where torrential downpours are common, and soil erosion is a huge problem. Harvey asserts that mixed farming can heal the wrecked soil, rebuild the humus, and restore the millions of tiny creatures that thrive in healthy soil. If people did this everywhere, enough carbon could be sequestered in the soil to snuff climate change. Listen to this: “A return to sound husbandry in agriculture would end global warming without the need for motoring cuts.” Oy! When my Norwegian ancestors settled in Iowa in 1879, folks were astonished by the coal black topsoil that could be up to 12 feet (3.6 m) deep. This super-fertile soil was created by thousands of years of healthy tall grass prairie. Today, this treasure is nearly gone. Plows are turning up yellow patches of subsoil. A wise elder once concluded that the plow has caused more harm to future generations than the sword. Harvey explores many other subjects. His book is easy to read, and out of print. It will inspire you to psychoanalyze the suburbanites who spend thousands of dollars obsessively maintaining spooky freakshow lawns that look as natural as Astroturf. They must spend their nights having sweet dreams of chasing antelopes across the endless prairies. Harvey, Graham, The Forgiveness of Nature: The Story of Grass, Random House, London, 2001. All life requires energy to survive, and our primary source of energy is the sun, a fireball of nuclear fusion. On Earth, the plant people absorb this energy and convert it into simple carbohydrates. Humans and other animals extract these nutrients from edible plants, and/or from the flesh of plant eating animals. 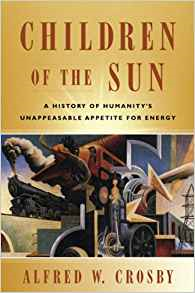 Alfred Crosby’s book, Children of the Sun, presents a history of how humans access energy. It’s a good companion to his earlier book, Throwing Fire, a history of projectile use, spanning from thrown stones to nuclear weapons. Both discuss the rapid acceleration of innovation, population, and ecological impacts. This growing instability over the centuries is largely off the radar in our day-to-day lives. Most of our brain cycles are engaged in the here and now, a pushbutton wonderland of nonstop magic. Crosby reminds readers of the obvious fact that fossil energy is finite, and the large, high quality deposits are approaching their finish lines. We are making little effort to wrap our heads around the notion that our high-impact energy-guzzling lifestyle has an expiration date. Instead, we pretend — with all our might — that the here and now is perfectly “normal,” and everything is excellent. When the spirits of our wild ancestors observe today’s “normal” they see a nightmarish insane asylum. Powerful historians like Crosby can vaporize the walls of our madhouse, and allow us to perceive the hundreds of centuries of turbulent cultural evolution that preceded our birth. We can observe the spirit of progress transition from an occasional draft, to a strong wind, and the full-scale hurricane of today. In the 200,000 years since the first Homo sapiens punched in at the time clock, almost all generations have been wild nomadic hunter-gatherers, living in a manner that was far simpler, and much closer to sustainable. For almost the entire human saga, this slower, gentler mode was the long term “normal.” But it wasn’t normal. Some scholars have speculated that if space aliens had visited 100,000 years ago, humans would have appeared to be ordinary animals of no significance. Wrong! We were roasting steaks with domesticated fire, a spooky trick never performed by ordinary animals. Fire was domesticated prior to Homo sapiens, maybe 500,000 years ago, maybe a million, nobody knows. When our ancestors burned biomass like wood, they were utilizing the solar energy stored by the tree. Fire provided some benefits. It intimidated hungry predators. It enabled our ancestors to survive in regions outside the tropics. It made cooking possible, a huge advance. Cooking partially predigests foods, making it easier for our guts to extract more nutrients from them. It also transforms a number of inedible substances into edible sources of nutrition. Chimps spend six hours a day chewing raw foods. Of course, progress is never free — fire making eventually led to huge unintended consequences, like megafauna extinctions, industrial civilization, the population explosion, and an unstable climate. It’s fun to play “what if…” What if that first fire starter, who learned how to make sparks with friction, had been ripped to shreds by hyenas prior to his or her discovery? Without fire, furless hominids could not have survived in chilly non-tropical regions. The snow monkeys of Japan solved this challenge by evolving heavy winter coats. Would Homo sapiens have ever evolved at all, limited to a raw food diet? Would the Americas and Europe of today still be human-free wildernesses, home to healthy populations of mammoths, bison, and sabertooth cats? Over time, our ancestors got better at hunting and basic survival. When some groups moved out of the tropics, they encountered conditions for which evolution had not fine-tuned them. They needed tighter shelters, warm clothing, and food storage for the lean seasons. Clever innovations could increase the odds for survival, and the cleverer we got, the better. Over the millennia, our addiction to innovation snowballed. Like an arms race, the groups possessing the most powerful juju were likely to displace or erase the bubbas with inferior juju. And so, the clever ones spread around the globe. Growing numbers eventually ran out of uninhabited lands to colonize, leading to growing friction. Too much cleverness eventually led to what Ronald Wright called “the perfection of hunting.” By killing megafauna a bit faster than they could recover over the centuries, big game gradually got scarce. Our menu shifted toward small game, and then to aquatic edibles. The domestication of plants and animals was another Earth-shaking innovation. We could now exploit solar energy more efficiently. More people could live on less land. Never before had we controlled so much energy. Population grew, spurring instability. The enslavement of animals like horses and oxen provided us with pack animals to carry stuff, and traction animals to pull stuff. No longer was the work in human communities performed solely by human muscle power. Enslaved animals could be exploited in many ways. By A.D. 1000, clever ones had learned how to capture more energy with waterwheels, windmills, and sailing ships, but muscle power was still the primary energy. We were drifting toward the limits of utilizing solar energy via agriculture and burning wood. As forests disappeared, the clever ones began burning coal. Eventually, mineshafts reached the water table, and muscle powered gizmos were unable to remove the water fast enough. So, brilliant lads invented steam engines that could pump water and keep the mines dry. Until maybe 1700, human society ran primarily on the muscle power of humans and animals. The steam engine, like the domestication of plants, animals, and fire, was a major advance with horrendous unintended consequences. The speed of innovation became a constantly accelerating whirlwind — locomotives, steamships, and multiple-spindle spinning machines. Lighting switched from the flickering hearth fire, to candles, then whale oil lamps, then coal gas, then kerosene, then electric lights. For a while, the Peak Oil doomsters made us nervous, with their predictions that the production of conventional oil would likely peak around 2005, which it did. But we got distracted by the growing production unconventional oil from oil shale (fracking) and tar sands, and returned to pretending that we have no limits. Let’s go shopping! Thankfully, Crosby provides readers with an embarrassing birds-and-bees talk about EROEI (Energy Returned on Energy Invested). In the 1930s, the EROEI of oil production was 100:1 — it took one unit of energy to extract 100 units from the underground reserves. When he was writing in 2006, it had dropped to 17:1. Today, it’s less. Low EROEI means that lots of oil will be left in the ground forever, regardless of how high the price eventually rises. Imagine having a job that paid $100 per day, but the bridge toll to get there was $105. It’s a short book, and very easy to read — no charts, graphs, or techno-jargon. Crosby describes the uncomfortable facts of life in a calm and non-hysterical way. I have zero complaints about it. It’s an excellent intro to energy. He briefly discusses the limitations of alternative energy sources. The limits are more thoroughly discussed in Renewable Energy Cannot Sustain a Consumer Society. The huge downside of nuclear energy is better addressed in Too Hot to Touch. Other energy-related books include Snake Oil: Fracking’s False Promise, Cadillac Desert, The Big Flatline, The End of Growth, Techno-Fix, and Afterburn. Crosby, Alfred W., Children of the Sun — A History of Humanity’s Unappeasable Appetite for Energy, W. W. Norton & Company, New York, 2006.